We arrived on the island of Penang after a flight from Chiang Mai in Thailand. We arrived in the airport late at night. After hitting an ATM, we paid for a taxi coupon to get to our hotel, such as it was. The drive in from the airport to Georgetown took about 40 minutes. The Cathay Hotel was described in our trusty Let’s Go guidebook as an "old colonial" hotel with lofty ceilings, and perfect for couples. We decided to splurge on it – it was twice the price of other Georgetown hotels and about 10 times what we’d been paying in Thailand. Well, the entry and lobby area was somewhat impressive, with a sunken lobby and big dual staircases leading up to the sky high second floor. If you closed your eyes, you could imagine a time when this hotel would have been beautiful. Passing the sign for the "Men’s Health Club" ..ahem.. we got to our room. Yes, it had high ceilings. But any romantic illusion stopped there. The ceiling was sheetrock. The walls were worn and dirty with peeling paint. The shower, although it did have hot water and was private, had a hand held shower-head with randomly burning hot and freezing cold water. But the most lovely touch in our room was a hand scribbled graffiti just beside the mirror from some long departed hotel guest: "Do not leave anything of value in this room, it *WILL* be stolen by the staff". So, after heading out to the nearest payphone and making alternate arrangements for our accommodation the following night (it was too late and we were too tired to change hotels that evening), we went to sleep. 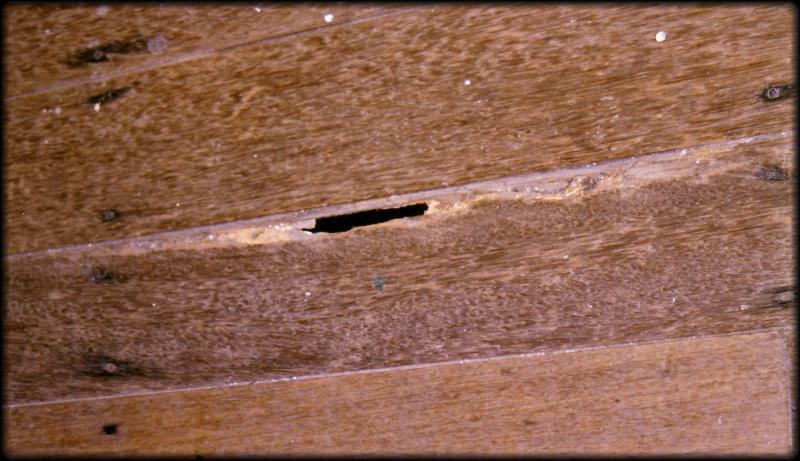 Just one of the many holes through the floor at the Olive Spring Hotel. The following morning we headed over to the Guidebook’s highly recommended Olive Spring Hotel, and found out just how nice a hotel the Cathay actually was. Our room was on the third floor of a ramshackle old wooden building, with random holes in the floorboards and stairs, large enough that you could clearly see down to the floors below. In most first world countries, this building would have long since been condemned. But not in Malaysia. The "room" (such as it was) wasn’t so much of a room as a partially enclosed space. The walls didn’t reach all the way to the ceiling, so every noise of every other guest, or every noise from the lobby or street could be heard loud and clear. Not to mention that if we wanted to use the toilet, we had to risk life and limb going down those stairs (which were pulling away from the wall). We should have just switched hotels again, but since we’d never been to Georgetown before, we wanted to start seeing the sights. Khoo Kongsi (Kongsi Clan House). We decided to start the day with a bus ride out to Dhammikarama Burmese Buddhist Temple and Wat Chayamang Kalarm. They were significantly less then inspiring (now we understand why neither of the hotels had even heard about them). They were badly kept up and featured strangely pink Buddhas. However, they were conveniently located across the street from one another. We hopped a bus back to check out the sites back in the main part of town. They were not much better. We visited a few temples. 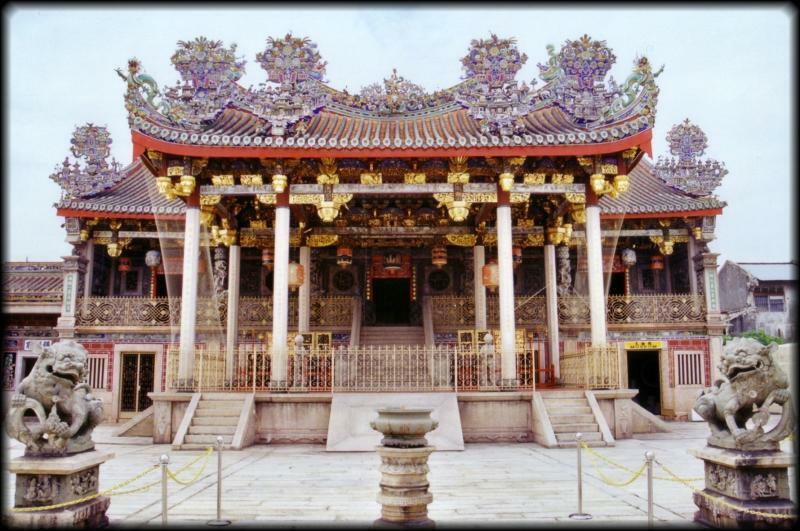 The Khoo Kongsi family Clan House was the most interesting, and was still pretty unspectacular. We visited little India, where we saw an old man on a bike get slammed into by one of the many motorcycles racing around town. We stepped over mounds of trash to get into the Kuan Yin Temple (Goddess of Mercy) temple, checked it off our list, and moved on. 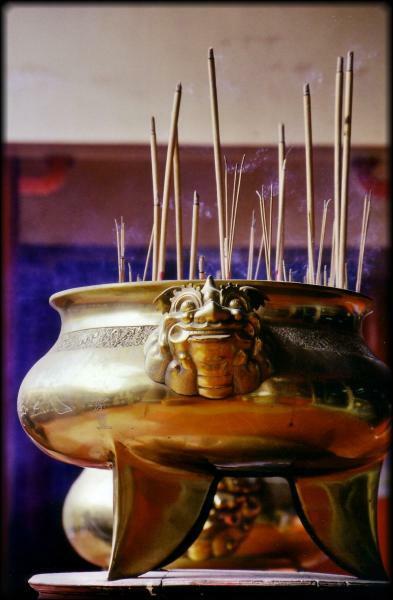 By about noon, we were done with sightseeing in Georgetown and decided to try one of the day trips that were recommended in the guidebook, the Kek Lok Si Temple. The bus dropped us off about a 15 minute walk away. On the way up, we were forced into walking up a path with dozens of tourist souvenir stalls. Being the only tourists in sight, they were pretty aggressive for business. Upon finally arriving at the temple, we were greeted with a dirty pond of stagnant water full to the brim with turtles climbing over each other as they desperately tried to get out of the filthy water onto the little land that was available to sun themselves. Oh, PETA, where are you?? This was pretty typical of our experience in Penang. 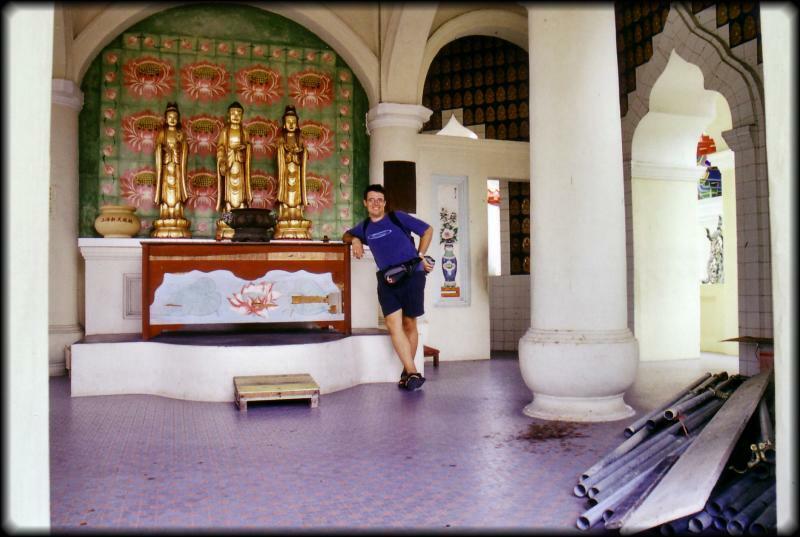 Half way up the 7-tier Kek Lok Si Temple (The Pagoda of 10000 Buddhas) , we found this mess. It looked like they'd started renovation on it years ago and had just given up. It was around this time that we gave up and headed for the mall. The temple itself was decidedly non-authentic. Almost each holy room seemed to also house a not-so-holy souvenir stand selling bulk-produced cheap trinkets (the same you see in every tourist stand). We paid our $5 each to climb the 7 tier pagoda (the one you see in all the tourist pictures). The tower is not well kept up – paint is falling off everywhere, an altar lies in ruin from some construction project long since abandoned. Scaffolding equipment, caked with dust, is strewn about the different floors of the pagoda. Bare wires hang down from the ceiling along the narrow crumbling stair case. After the tower fiasco we decided it was time to give up on the sights of Georgetown/Penang, and head to the shopping mall. 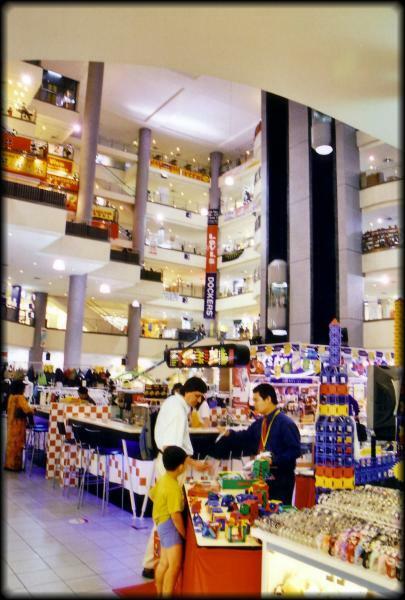 Inside the big shopping mall in Komtar, which is a big tall modern building in the middle of the city. Komtar is a modern eyesore of a building that dominates the downtown area. It is where intercity and local buses depart from, as well as a location for government offices. Fortunately, it also houses a modern, clean, A/C, cheap (and huge) shopping mall inside. We killed the rest of the day shopping for Malay t-shirts with hillarious Engrish written on them ("Vast Regins of Spase!! ", "Give me love – good friends is here!") and surfing the net, wondering why we’d left Thailand.